It does feature a couple of tweaks to dialogue in both stories, nothing entirely crucial––mostly to improve the reading experience as a physical book (as I’ve written about) or to clarify––but enough to warrant mentioning. The most exciting things are the inclusion of some new art (not to be confused with new pages). 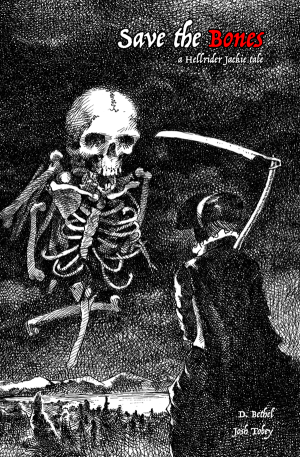 The most exciting addition (again, as mentioned before), however, is that Josh Tobey––artist on “Save the Bones”––was kind enough to create a “cover” for his story and it is gorgeous. If you want one, pick one up and support independent comics at the same time! The store is a bit bare right now, but I’m in the process of adding some prints I have made as well. Keep an eye on it in the coming weeks. 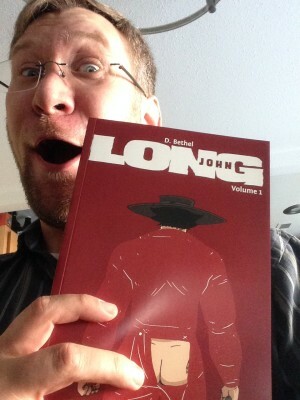 If you have any questions or problems purchasing the book, please e-mail me at longjohncomic@gmail.com. Again, thank you all so much for your continued support and I hope the book meets your standards. 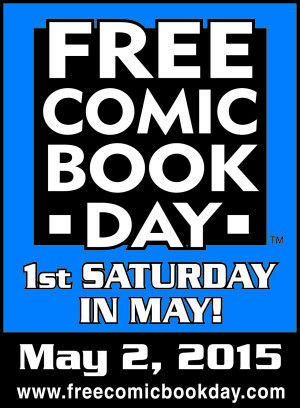 Today, May 2nd, is Free Comic Book Day all around the country. If you’d like to participate (that is, get free comics), then check out your participating local comic shops and have fun! As mentioned before, a local Sacramento comic shop––the esteemed Empire’s Comics Vault––is continuing its local tradition of hosting a mini-con as well as giving away 20,000 free comics to those who show up. It’s shaping up to be quite the event, with at least 15 local comickers as well as pro wrestling, cosplay, food trucks, and more. Most importantly, this show will be the premiere of the first Long John book! 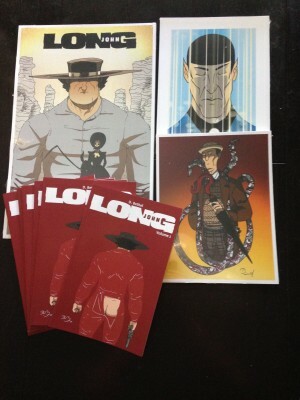 The books were printed by RA Comics, a local printer out of Elk Grove, CA. The last few issues of Eben07 were printed there, as well as the Long John Preview Book, so it made the most sense to go through them again for the Volume 1 printing. It collects “Sunza” and “Save the Bones,” and there are minor tweaks that have happened from what was seen on screen to what ended up on the page, but stuff that you probably wouldn’t notice if you weren’t looking for them (mostly slight dialogue tunings). A few pages of art (not comics) have been added to bookend “Sunza” with “Save the Bones”; most notably, Josh Tobey––artist for “Save the Bones”––has created a brand new “cover” image for the short, the lineart of which premiers below (if you want to see it in color, buy the book). It’s an amazing drawing and I’m incredibly happy he was willing to do it for the book. I have some new art in there as well as closing images to both “Sunza” and “Save the Bones.” The book itself I’m quite happy with. At 48 pages, it’s perfect bound (so, no staples) so it’ll look and feel a bit different from a normal comic book. After reading through it again (which I’m surprised I did; frankly, I’m a little exhausted with these pages by now), I’m struck again by the same feeling I had when reading the first Eben07 book back in 2009. Flipping from page to page is an entirely different experience than reading (at the time. Sorry) two pages a week. For me, the jail scene goes by so much faster for me. Some scene changes become more abrupt. This is all based on how I thought of the pages, however. If you read it in large chunks or all in one sitting, then it shouldn’t be that different of an experience. The biggest difference for anybody reading it as a book rather than online is actually having two pages next to each other, which alters the reading experience. It shouldn’t be jarring for me, since all the pages were conceived in book format, so the page order hasn’t changed since the thumbnails, but perhaps it’s the final pages lined up next to each other forces me to consider them as complete rather than as a compiled layers of process. It’s interesting and I’m glad it’s finally the book it was meant to be. I can hear it already that you want a copy of the book. Calm down. I’ll get that set up after Free Comic Book Day through my Etsy store and I’ll let you all know about pricing and availability as soon as it happens. However, the book is not the only thing I’ll have at Empire’s Comics Vault Free Comic Book Day Mini-Con 2015. I’ll also have some other exciting stuff; namely, prints! 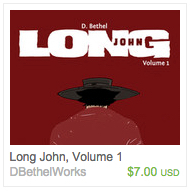 I’ll have an 11″x17″ print of the Long John Preview Book cover. Also made up––kind of last-minute decisions––8.5″x11″ prints of my Spock/Leonard Nimoy Tribute drawing and the “Doctor CthulWho” print. These were printed up beautifully by Alphagraphics in Rancho Cordova, CA, and their turnaround was astounding. 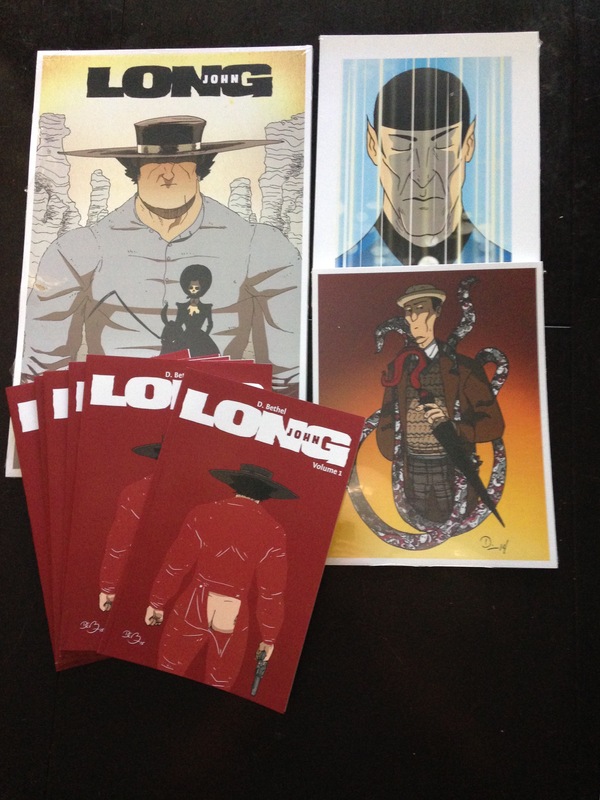 The book and the prints, again, will all be available on the Etsy store shortly, but after Free Comic Book Day. So, go out to your local comic shop and read free comics (and buy something to help support your local store). For those that don’t know, Free Comic Book Day is an event in which not only “The Big Two” (Marvel and DC comics, for what it’s worth) but all major publishers contribute comics to any participating local comic shop to give away to their clientele for free. As an event, it has grown every year for the last decade or so. It’s gotten to the point where publishers make specific, special comics only for distribution on Free Comic Book Day (a lot of short anthologies and reprints, rarely new content). No matter what, it’s a big day for comic books as it’s basically the big push to get new readers––something the industry sorely needs. A lot of local shops host events in celebration. Luckily, my local shop––Empire’s Comics Vault––likes to make it a big deal not only for comic books, but for local comic creators. Officially the Free Comic Book Day Mini-Con, Ben (the owner) has asked me, along with a nice array of very esteemed talent, to exhibit at the event. As reported before, Ben even filmed an interview with me for the world to see.